PRACTICES AND FASCINATION IN THE ARTIST'S STUDIO After being closed for renovation for eight months, the Musée Bourdelle is kicking off its reopening programme with the exhibition ‘Mannequin d’artiste, Mannequin fétiche’ ('Mannequins: from the artist's studio to fetish object'). This exhibition with its dramatic design retraces the history of this studio secret from the Renaissance to the 20th century. ﻿It includes rare artist's mannequins dating from the 18th century to the present day; 'articulated dolls'; display mannequins by Siegel and Imans; paintings by Gainsborough, Courbet, Burne-Jones, Kokoschka, Beeton, de Chirico and Annigoni; drawings by Salviati and Millais; plates from the Encyclopédie; patents; and photographs by Bellmer, Man Ray, List and Denise Bellon. 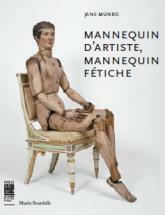 For the first time, the 'Mannequins: from the artist's studio to fetish object' exhibition is lifting the veil on the relationship between artist and mannequin, with nearly 160 exhibits from public and private collections from both France and abroad. Miniature, life-size or articulated, artist's mannequins have been used since the Renaissance to improve composition and render the way in which fabrics fall, as well as anatomical proportions. Infinitely more obedient and always available, these substitutes for living models are vital partners in the creative process. The exhibition has been jointly organised with the Fitzwilliam Museum in Cambridge, where it was first shown under the title ‘Silent partners – Artist and mannequin from Function to Fetish’. It is the result of six years of research by Jane Munro, keeper of Paintings, Drawings and Prints at the Fitzwilliam Museum and Director of Studies in History of Art at Christ’s College, University of Cambridge. It is accompanied by a scientific reference catalogue. Tarifs exposition : 9 € T.P. ; 6 € T.R. Where to see more about Bourdelle?